You would think that the discussion of how to win would be clear. When was the last time you actually decided to engage with, develop a long term relationship with a mealy mouthed milquetoast mixed message marginally interesting person who bored you to death? Or when you gave money and time to some one that lied repeatedly, flirted incessantly with another and you still chose to continue the relationship. To add insult to injury you were also fed left-overs for dinner and you continued to suffer with a completely unsatisfying date, engagement, business partner or marriage? While most of us will eventually leave those partners, lovers and friendships, we continue to dance with RINOS, and line up to vote for sloppy seconds and huge disappointments from Republican elected officials who not only take our support for granted but are all too often ethically challenged, and more often than not leave us to pay for their grandiose schemes and have a deaf ear to our complaints. Year after year like someone addicted to some toxic relationship we return to the polling place and pull the lever for the likes of Arlen Specter, Olympia Snowe, Charlie Crist, Chelsey Graham, and the John McCain’s of the world. I do not mean to imply that these are bad people. They just don't seem to understand who pays the freight and who sent them to one of the most select clubs in the world. However, Congressional session after session these folks do things that really upset the base of the Republican Party. We let them know we are not happy. And they of course to reinsure their re-election make nice and take us to dinner or buy us some flowers or some fancy bauble and all is forgiven. Then they do it again they reach across the aisle, and join gangs of 12, 14, 8, and support Amnesty, Cap and Trade, increasing taxes and fees, TARP, the Stimulus, The New Youth Corps, the list goes on and on. Worse still they act like this is OK. When we confront them we are hit with a wall of excuses and denial and obsfucation and never ending justification. Party officials, pundits and others, commentators and talking heads who appear lost in personality and the medium continue to defend their support of these folks, and discount us and our opinions and even smear us, failing to understand the fallacy of their actions. We will never win running as Progressives except in really blue states, and we should just leave them to their own devices. Let the Democrats bury blue states in their excessive tax now spend now worry later about what it cost break the treasury later policies. We on the right find ourselves in a fight to save this great experiment that requires two healthy and vigorous parties for our Republic's designed electoral process. The left seems healthy enough. It is the right side of the aisle that is anemic and in need of a consistent message and a determination to move just a few degrees right of the center like 10 or fifteen. Then we can attract all those Independents that describe them selves as conservatives and embrace their common sense, no nonsense pay as you go, healthy community, attitudes and win lots of elections for a long time. It is our message that counts. Our tent can be really large, but our message needs to be consistent, and frankly it has not been for a long time. We need to define our message and stay on point. I think it is time we started looking for quality partners who will keep their end of the bargain and respect us enough not to sleep with the enemy. Melody !! 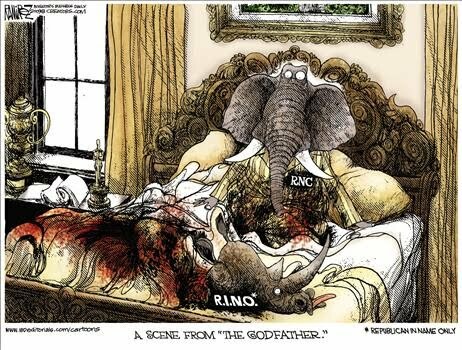 NEVER sleep with a RINO. Those dishonest cretins should get the boot as fast as they show up on a ballot. We should make a short list of good conservatives in Congress and defeat every other bum. Lord of the Flies, Swatting at Grandmothers! As Hawaii Goes So Goes The Nation?